Novalis matches concrete looks and wood-style plank accents to classic ornamental patterns to create an exciting contemporary statement. Abberly™ is designed and engineered for the demands of Main Street restaurants and retail settings with easy maintenance and lasting good looks. Our vinyl tiles are marketed under our own brand names as well as under the private labels of other retailers, distributors, and manufacturers in USA, Europe and China. Our two factories are conveniently located near the Shanghai port. One of the factories concentrates in the manufacturing of DIY vinyl tiles for the residential market, while the other one specializes in the manufacturing of luxury vinyl tiles for the commercial and heavy residential application. Our first factory was the first vinyl tile manufacturer in China that received ISO9002 certification. The combined annual capacity of the two factories reaches 2000 containers and our operation is highly scalable. 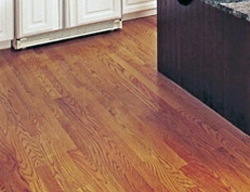 Over the years, aside from producing vinyl tile, we have gained extensive experience in manufacturing laminate, wood, and bamboo flooring through various joint ventures and partnerships. We are also constantly investigating new flooring products to take to the market internationally.